BELFAST, Northern Ireland, 2017-May-25 — /Travel PR News/ — A third Belfast young person has found success through George Best Belfast City Airport’s ‘High Flyers Apprenticeship’ scheme. Through Swann Training Services, Michael Cullinan joined the programme as an onsite firefighter in November 2016. Already, he has flown through the apprenticeship and completed the majority of his training. Following the successful completion of the required qualifications, the course will result in full-time employment at the airport’s Fire Service. 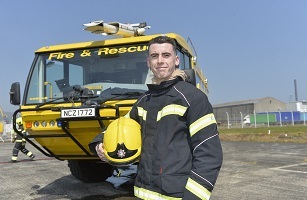 “Employment opportunities across the Fire Service are hard to come by and I was delighted to be given the opportunity by Belfast City Airport to complete my apprenticeship here. “All of the staff at the airport and within the Fire Service have made me feel so welcome, and I’ve already learnt so much. By partnering with local training providers in the Greater Belfast area, the airport’s apprenticeship scheme offers participants a work-based learning placement of up to two years in a vast range of disciplines, such as Business Administration, Hospitality and Catering and Retail. “At the airport, we are committed to supporting and investing in young people in order to give them every opportunity available to succeed. “Our High Flyers Apprenticeship scheme is a great way to give them an invaluable experience and kick-start their careers, as well as providing a real-life insight into a career. “At Swann Training, we continually try to enhance the lives of the young people we work with. “We are so grateful to work alongside Belfast City Airport as part of this Apprenticeship scheme. As one of east Belfast’s largest employers, the position is a fantastic experience for Michael, particularly in such a unique role. If you, or someone you know between the ages of 16 and 24, would be interested in the scheme, applications can be made through the airport’s chosen training organisations – Swann Training or Workforce Training. This entry was posted in Airports, Business, Travel, Travel Education & Courses, Travel Management, Travel Services, Travelers and tagged employment, George Best Belfast City Airport’s, High Flyers Apprenticeship Scheme, Jackie Courtenay, Michael Cullinan, Paddy Hughes, Third apprentice. Bookmark the permalink.